Most of you who read this blog are software developers. You know the importance of separate DTAP (Development, Testing, Acceptance, and Production) environments. However, not everyone understands this. I was recently at the WordPress Nashville meetup when someone mentioned having a development environment for their blog and you could here the crickets chirping. A lot of the attendees of that – and many other WordPress meetups – are not developers and may have never considered the need for a development area, after all, they don’t develop, right? Everyone however, experiments. Whether it’s a new theme or a new plugin, you really, really need someplace to test things. one of the worst thing you can do is what I do with this blog, just install things and play with them in production. You need someplace where you can try out new plugins, new ideas, new themes. Not necessarily someplace where you post all your content, WordPress does a great job of allowing you to test things out content-wise before committing. Development systems used to mean having your own server; as a matter of fact, I still do have one running here at the house. I do not recommend this though. It’s a gross waste of resources if you are just testing out a single blog, or even a few. You could also load WordPress on your laptop or desktop but I don’t recommend this either. To make it work though, you have to install and maintain a complete “web stack” (Apache, PHP, MySQL) This is just more software on your machine that has to be kept up to date. There is a solution though, actually, I’ll present you with two. One for PHP developers who know what they are doing and want control, and one for regular bloggers who just want someplace to test plugins and themes before pushing them live. In both cases though, the services are free. Create an account. Find me on twitter if you need a beta invite and don’t know how to get one. Create an application inside that container. At this point, you have the option of selecting what kind of application, select WordPress. Using git, clone the application to your local machine. Code or experiment, commit, push, test, rinse repeat. Again, this is a developer solution. I left out a lot of small details like setting up keys, etc. The docs tell you how to do that but if you aren’t familiar with the concepts, . You wouldn’t play with a jackhammer just because you thought ti was pretty, don’t play with tools like phpcloud.com unless you understand them. Using phpcloud.com you can install themes, plugins, hack the core, (don’t you dare) or do just about anything else. To install plugins, you unpack them locally in the plugins directory, commit them to the repo and push. Then go into your test area and activate them. It’s not quite as simple as using the built-in installer but you know the saying “with great power…”. Once you have tested a plugin, theme, widget or idea and know that it works properly, feel free to install in production knowing that you’ve done your due diligence. I will mention one downside of phpcloud.com for WordPress developers. The automatic install and upgrade system will not work. You can try, you can fiddle with permissions all you want but at the end of the day, it’s just not going to work. Boaz and the team are aware of this shortcoming and it’s on their roadmap to fix. Ok, if you aren’t a developer, there’s still a way for you to get a free development area and it’s still important for you to test thing before you start mucking around with your production system. For you non-developers, use the free offering from my friends over at phpfog.com. Like phpcloud.com, there are limits to what you can do with the free offering but you should be able to get up and running with the free offering. The main limit you will hit is the 20MB space limit on your database. If you like phpfog.com, you may want to consider either setting up a pay account or moving all your hosting over to them. If you do the latter though, don’t just use your testing area as your new production area. If you do, you are really missing the point of this post. Create an app in your shared cloud. One of the questions is what domain name to use. If you are not familiar with DNS settings, use a phpfog.com subdomain. It’s easier that way. If you do understand DNS and know what you are doing, you can setup test.yourdomain.com or beta.yourdomain.com or something like that. Be patient. No matter what it says, it can take up to five minutes for your app to be created. Now you can begin installing plugins, themes, and widgets. If you are working with a developer, they can setup their ssh keys and get to the source code. Unlike phpcloud.com you can use WordPress’ automatic install and update tools to keep your test site up to date. No matter which way you go – phpcloud.com, phpfog.com, or some other solution – every WordPress blogger needs to have a development area that is wholly separate from your production environment. This means don’t just install another instance of WordPress on your production server and call it test. It needs to be separate from your production server. In this post we’ve discussed two solutions that you can use to get a test system up and running for free but there are other ways to accomplish this. The takeaway is not to use one of these services but to get a test system setup and use that for all your experimenting. Wow, what a day today was! I’m going to cover a lot of ground in this post so unless you are friend or family, you may just want to read the next summary and skip the rest. For those who have not heard, yes, I will soon be leaving Zend and moving to Ibuildings. Yes, that means I am also leaving Nashville, TN-US for Utrecht, Netherlands. No, the lovely and talented Kathy will not be going with me immediately but will be joining me after my son graduates high school. Yes we are both very excited about it. The first question most people ask me is why? I mean a lot of people asked me that. As I’ve said to just about anyone who would listen, I have a great job! Zend is a great company to work for, they provide for their people, and I have absolutely no complaints about my time at Zend. This will come as a surprise to a few Zenders as all they have ever seen me do is complain. I’ve been allowed to create my role at Zend and that is a rare thing at any company. I was originally hired at Zend to be an editor for DevZone and I was just supposed to write articles and code. (those of you who have seen my spelling and grammar gaffes can stop laughing now) Over the course of 2.5 years, Mark de Visser, with the backing of Andi, Harold and the rest of this awesome company, put up with my antics. They paid me to work with the PHP community. I got to travel to conferences, hang out in IRC, they even let me be the Master of Ceremonies of ZendCon. This truly is a dream job. It is so great that in the 2.5 years, I’ve turned down most offers to interview and the few serious offers that came my way. This was were I felt at home. So back to the question, why leave a dream job at a great company? The only answer I have is “opportunity“. Most of you have never read my article “Nerd Herding” (and I don’t recommend you bother now) but in it I talk about the fact that for developers, interesting projects are just as important as a good salary. While I still love what I do at Zend, the opportunity offered to me by Ibuildings was just too great to pass up. So that is why, after over a month of thinking about it and discussing it with the lovely and talented Kathy, we decided that this was a chance I couldn’t pass up. 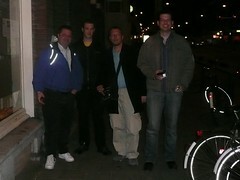 One of the great things about my job, both at Zend and at Ibuildings is that I get paid to work with the PHP community. I told someone this at ZendCon but it bears repeating here. PHP is my fifth programming language, that means I’ve been a part of 5 programming communities. None of those communities have come close to being as vibrant, fun and welcoming as the PHP community. PHP developers should not take this community for granted, it is something special. It is to this awesome group of mixed nuts that we call the PHP community, that I give a big hug and say thank you. Thank you for all the tweets, blog posts, IMs and irc well wishes today. Thank you for your friendship. Thanks you for welcoming me in even when you didn’t have to. You guys and gals are teh awesome and I wish I could call each of you by name and say thank you. (if I tried, we’d be here a while an even then, I know I’d leave someone out so I’m not going to try) It has been a blast working with you while at Zend and I look forward to working with you at Ibuildings! I’ve talked a lot about Zend in this post but I can’t close without saying a big hello to my new Ibuildings family. Thank you for welcoming me in such a warm fashion. I’ve never had this much attention paid to me coming to a new company. Honestly, it humbles me to think that I’m moving to a new company and country and yet I already have good friends in both. I am looking forward to working with each of you! I am positive that Zend will be hiring someone to take over DevZone and my other duties. I know that phpc will embrace them as you did me. (because again, you guys and gals rock!) DevZone has become a regular daily stop of a lot of PHP developers and I am sure it will only get better. As for me? well, I’m not going anywhere. (figuratively speaking) I’ll still be hanging around on Skype, IRC and IM. If you need to contact me, my contact info is always on my EPK. I encourage you to ping me if I can help you. It’s been an awesome 2.5 years at Zend and I look forward to a number of awesome years at Ibuildings! A good chunk of this blog post was posted over at DevZone. However, this one contains more personal observations and general nuttiness. I’ve just returned from my second trip to the Netherlands and, as with the first one, I had a wonderful time. This time, I was honored to speak at the PHP Business Seminar put on as a joint project by my good friends Ibuildings and my new friends Sogeti. Amsterdam is a beautiful city and I always love when I get to travel there. The weather was beautiful and I was lucky enough to have a couple of hours to myself. Last time I was there I was so jet lagged that I got a whopping 30 minutes in the Van Gogh museum. This time I got there in the morning and spent about 2.5 hours wandering and admiring his art. Also, there was a street fair happening in one of the city squares (I believe it’s called Waterloosplain but I am probably wrong.) It was really fun, not because it was big or because I paid 3EU to rinde rides, it was fun because all the music was old 70’s tunes that had been re-mixed into techno dance tunes. One part of the fair was this wheel on the long arm of a pendulum that would swing back and forth as the wheel rotated. People sat in the wheel. This thin had to come within 20 feed of the Madam Tussauds building and at it’s apogee lined up with the big glass window on the 4th (?) from of Madam Tussauds. Monday evening Ivo Jansch, CTO of Ibuildings stopped by the hotel and picked my up for dinner. Ivo and I joined Stefan Koopmanschap, Michelangelo van Dam and Remi Woler for dinner and drinks (and one fine Cuban Cigar provided by Michelangelo, dude, seriously, you rock!) It was great catching up with old friends and as one would expect from that group, the conversation never strayed far from PHP. We ate and drank way to late. Remi blogged about dinner here and posted a picture that Stefan took. Tuesday morning, the day of the conference, came way too early after a late night with friends. Lucky for me, the conference was in the afternoon and evening. Ivo Jansch, CTO of Ibuildings, drove me out into the beautiful Holland countryside to a great hotel where the conference was being held. There I met 70+ people, both management and developers, all gathered to talk about PHP. To be honest, I did not pay attention to any of the sessions; in my defense, they were all in Dutch. I did, however, manage to catch a few of the phrases like “Zend Platform” and “Zend Studio” and eventually figured out that “Pey-Ah-Pey” meant PHP. My cue to start paying attention was when the host for the day started speaking in English. At that point, I was pretty sure it was for my benefit only. Presenting my session was fun, ok it was fun for me; I hope it was fun for the audience. The slides can be found on SlideShare, it’s my slideshow called Gardeners, Not Gate Keepers but honestly, there are only 14 of them including the vanity slide and if you weren’t there for the conference, they won’t make much sense. I talked about the fact that thanks to things like RIAs, Mashups, APIs and cool tools like IBM’s Mashup Hub (built on “Zend Framework”:http://framework.zend.com) and WS02’s Mashup Server, our roles in IT were changing. We no longer need to be the Gate keepers to the infrastructure but we need to be gardeners of the application. We need to provide the tools for our users and let them participate in the building of the application. (In retrospect, Groundskeepers might have been a better analogy) Anyhow, I tortured the analogy for 45 minutes before it was all over. As I told the audience, my presentation wasn’t a “Do this or else” type of presentation but more of an “Here’s an idea I have, see if you can use some of it where you are” presentation. The audience was great for the session and afterwards I was asked several good questions and had some great discussions about the session and PHP in general while eating dinner. My answer to this is, yes, of course you will. However, no more so than you are doing now. It’s really a mindset change. By (as someone put it on twitter today) supplying them with the rakes and showing them how to use them, we are encouraging users to help take control and responsibility for the application. You have to see the whole show to really grasp it because I am certinly not advocating allowing anyone and everyone to start tinkering with code. This is my current presentation and I’m available for Business Seminars, users groups, kids parties and weddings, so drop me a line if you’d like to talk about me coming to your meeting. Following dinner, we changed audiences and went at it again. At this point I need to say a big thank you to my friends at Ibuildings for bringing me a RedBull. I’m pretty sure I would not have made it through the second session with out it. (As it was, I managed to shave 10 minutes off my best time with it.) The evening’s audience was almost all developers, the majority of them from Sorgeti and Ibuildings but there were a few from other companies that snuck in for the fun. Peter C. Verhage and Robert van der Linde from Ibuildings and Sogeti respectively both reprised their sessions as did I. I’ll have to say, I had a lot more fun in the evening talking only to developers. All in all, it was a great, but all-too-short conference. With only 1/2 a day and a hand full of breaks, there was no way I could meet everyone. The people I did meet were all great and I hope to run into them online to continue the friendships that were formed. I would like to say a special thanks again to both Ibuildings and Sogeti for putting forth the effort to put on a conference like this. As PHP’s popularity grows, it’s good for managers to know that companies like Ibuildings, Sogeti, and of course Zend, are there to help them.